India had a remarkable outing in Australia between December 2018 and January 2019, when they won both the Test series and ODI series 2-1 and tied the T20I series 1-1. 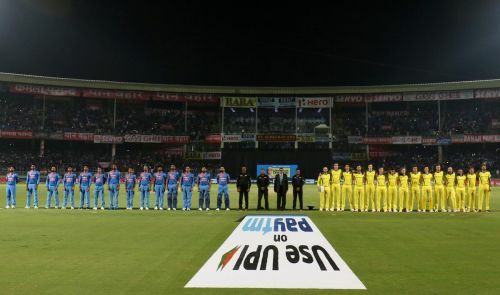 And now the Australians have come to India for a return tour, and the first T20I concluded with the visitors winning by three wickets and gaining an unassailable series lead with only one more game to go. Winning the toss, Australia opted to put India under the batting test first, before attempting to chase. And the visiting bowlers did a pretty neat job, restricting India to just 126/7 in the allotted 20 overs - by no means a small feat, especially on an Indian surface. Only KL Rahul(50 off 36, 6 fours, 1 six) was able to produce an impact with the bat, while the rest meekly surrendered. In reply, the Indian bowlers also produced a good show by keeping the Aussie batsmen on their toss, but opener D'Arcy Short(37 off 37, 5 fours) and Glenn Maxwell(56 off 43, 6 fours, 2 sixes) reduced a lot of the load for the visitors. In the end, Pat Cummins and Jhye Richardson carried them home on the very last ball of the game. Australia thus won by three wickets. Let us now take a look at three reasons why India lost today's fixture against the Kangaroos. The reasons are pretty obvious and they are as follows. KL Rahul has, of late been facing a lot of fire for many reasons - primarily his lack of form which was evident since the T20I series against Australia in early December 2018, and secondarily for his role in the Koffee With Karan fiasco that rocked the Indian cricketing sphere early this year. But Rahul banished many of his demons tonight with that singular knock of his, proving once and for all as to why he is eligible enough for a spot in the Indian eleven. The other batsmen, who should have taken a page of Rahul's book, merely failed to deliver anything worthy of their name and fame in the cricketing arena. While Rohit Sharma, Rishabh Pant, Dinesh Karthik and Krunal Pandya fell for scores less than or equal to five, Virat Kohli seemed to start off well but displayed more cheekiness than necessary in going towards Adam Zampa and hoicking, a poorly-timed shot turning into a simple catch in the end. MS Dhoni for his part had to huff and puff to make every single run and took as many as 37 balls to produce 29 runs. In the big pictue, it may seem a great contribution, but it could have been more. India managed to score 49 runs from the batting power play and 80 runs from around the first ten overs. That they decelerated since then, seems to have not much of an excuse. Everyone apart from Rahul could have tried harder, we fill. Given how we saw the Aussie innings pan out later, even 10-15 extra runs would have been an adequate addition for a win.